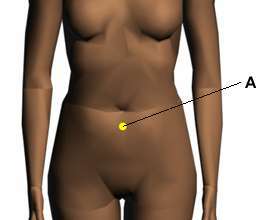 Acupressure Points for Relieving Water Retention and Bloating, working on these points can help you get better quicker. You do not have to use all of these points. Using just one or two of them whenever you have a free hand can be effective. Location: Two finger widths directly below the belly button. Benefits: Relieves water retention, chronic diarrhea, constipation, and gas. Location: On the inside of the leg below the knee and under the large bulge of the bone. Benefits: Relieves knee problems, swelling, leg tension, varicose veins, edema, water retention, and cramps. Caution: Do not stimulate this point during the eighth and ninth months of pregnancy. Location: Four finger widths above the inner anklebone on the back inner border of the shinbone. Benefits: Relieves water retention and edema; a special trigger point for vaginal complaints and swelling. Location: One thumb width below the inside of the anklebone. Benefits: Relieves water retention, especially swollen ankles. Location: On the middle of the arch of the foot midway between the outer tip of the big toe and the back of the heel. Benefits: Relieves edema, especially swollen feet.